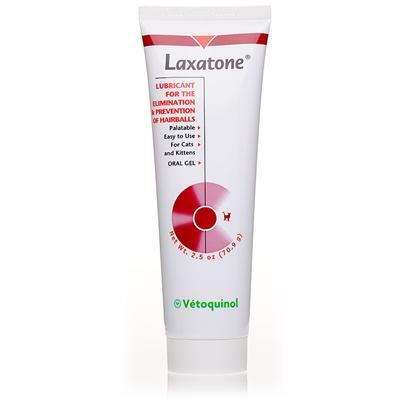 Hairballs, constipation, and nausea-oh my!-can make things tough for your cat, so use Laxatone. Available in tuna and natural flavors, the lubricant is specifically designed to manage hairballs in cats. It is veterinarian-recommended to lubricate the digestive system and aid in your cat's digestion of hair, thus aiding in the prevention of nausea and constipation. Laxatone also contains a beneficial iron supplement. Laxatone dosage amount depends on the animal and specific health issue, so be sure to consult the product information and/or your veterinarian. Dosage is generally a half-teaspoon per one to three days. When first administering Laxatone, place a small amount of product on animal’s nose to stimulate taste interest, then provide your pet with proper dosage.